Fleas aren't just irritating to you and to your pets when they bite, but the insects can also carry various diseases. These pests thrive when temperatures hover around 65 to 80 degrees Fahrenheit. Cold weather under 40 degrees kills adult fleas, but the larvae and eggs simply go dormant. If you have an outdoor flea problem in your lawn, don't wait for Mother Nature. Take matters into your own hands. Trim back stands of grass, weeds and other thick, shady growth. Flea eggs and larvae need shaded, moist conditions to hatch and develop. Dry out your lawn surface to break the pests' life cycle. Mow your lawn regularly, keeping it as short as possible for your specific grass species. 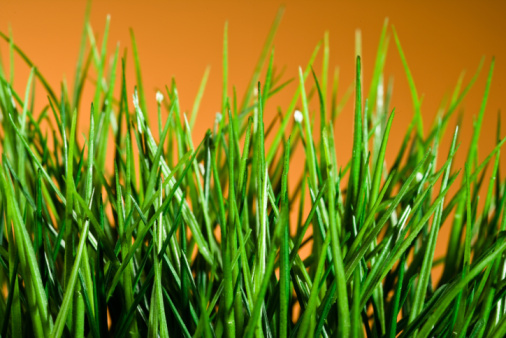 For most varieties of grass, you can cut it to as short as 1 to 2 inches. Shorter lawn height exposes the underlying soil to more sunlight and increases air circulation, quickly drying and killing flea eggs. Keeping your lawn and surrounding landscapes clean and tidy is often enough to lower flea populations to a level that's practically unnoticeable. 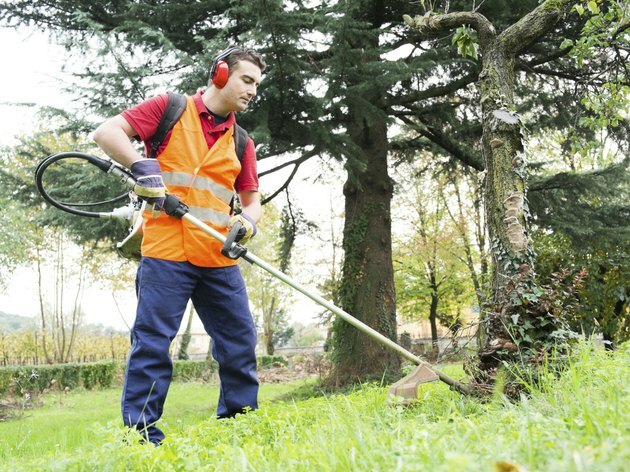 Rake your lawn and nearby garden beds to remove fallen leaves and grass clippings. Pick up pet toys, pet food dishes and similar items like unused garden tools or empty flower pots. Prune back overhanging shrubs, dense hedges and thick stands of grass, weeds and similar growth. By keeping your lawn as clean as possible, you create a habitat that's as inhospitable to fleas as possible. While fleas need moist conditions to reproduce and multiply, too much of a good thing is a very bad thing for these pests. On a day when you regularly water your lawn, turn on all your sprinklers. Break out the extra watering cans. Go a little extreme and flood your landscape. Use enough water so that the underlying soil is soggy. Soggy soil doesn't just drown the eggs and juvenile fleas. In such watery conditions, the dried blood matter that adult fleas feed on also gets dissolved and washed away, depriving them of all their food. Interestingly enough, female fleas need to feed on this dried blood before they can reproduce, so removing their food source also stops reproduction. Repeat once a month. Adult fleas live for up to 25 days, so monthly flooding that repeatedly drowns surviving fleas and breaks their life cycle can eliminate the problem. With proper lawn hygiene, chemical solutions like insecticides are rarely needed. Should you want to try a more direct approach to killing fleas, consider using diatomaceous earth. This all-natural dust dries out adult fleas and kills them. Wear safety goggles and a mask when handling diatomaceous earth, as the powder can be irritating if inhaled. Dust a light, even coating of diatomaceous earth on problem spots in your lawn. You don't need to treat your entire lawn. Instead, focus on areas that tend to be flea hotspots, including shaded areas, around outdoor pet shelters and 20 feet around areas where you or your pets congregate. Repeat the diatomaceous earth application after it rains or after you've watered your lawn. Treating your entire lawn with a chemical insecticide is rarely necessary, but you may wish to resort to an insecticide for heavy lawn infestations. In these cases, you generally just need to treat areas where people and pets congregate, as that's where flea activity is highest. For spot treatment on lawns, try a carbaryl-based insecticide spray labeled for outdoor use. Check the label for specific application instructions as product strength varies by manufacturer. For example, when using an outdoor flea solution with a 22 1/2 percent concentration of carbaryl, mix 1 1/2 ounces in 1/2 gallon of water. This is enough to treat approximately 500 square feet of lawn space. Or, try carbaryl granules. When using granules with a 2 percent concentration of carbaryl, you'll generally need approximately 2 1/2 to 4 1/2 pounds of granules per 500 square feet of lawn space. Sprinkle evenly on affected areas, then water your lawn immediately to dissolve the granules. Wear appropriate safety protection, such as safety goggles and gloves, when handling any insecticide. Keep pets and family off the lawn until it has fully dried after being treated with a spray or after being watered to dissolve any applied granules. Does Putting Lime on a Lawn Kill Fleas?